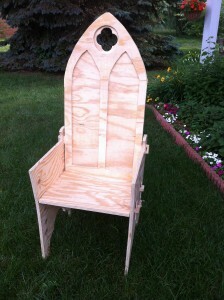 A Gothic Chair: Making Progress On My Camp Chair! 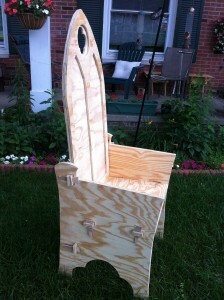 Have a seat, pull up a chair … my chair! I now have a gothic chair that breaks down for flat transport and goes together with just bits of wood (tenon keys). After deliberating for a while over what to do about the 12 mortice holes and how I was going to make them, I finally came up with a solution … the Dremel TrioTool. I LOVE this tool, It does everything necessary to make these woodworking projects — cuts, routs, and sands. 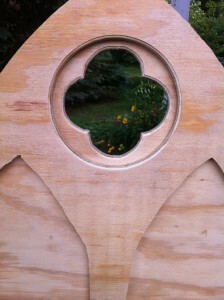 You can even do a nice rounded edge for decoration. If you’re thinking about doing some projects and aren’t sure what tools to get, get the Dremel TrioTool — it only cost me $89 by using a 10% discount coupon from the post office (normally $99). Me sitting in my new chair ... it works! Cut out quatrefoils in the sides of the chairs. But all in all, not bad for a day’s work! I spent a couple of hours yesterday, plus about five hours today. I’m torn between using plywood and non-plywood. I want to use the table on a regular basis as a sewing table, so I’m leaning toward non-plywood. But it’s expensive and I’m finding it hard to find 2″ thick wood that the first plans call for. 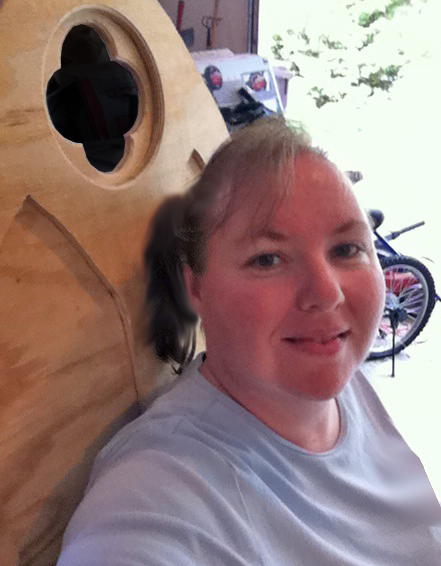 I am considering using a door slab (a door without paneling or a hole for a handle) for the tabletop. I used to have a table from IKEA that was essentially built like that and I never had a problem with it. And door slabs are only about $25. So I’d just need to find the wood for the legs and braces. Tomorrow morning I am going to a place we have here called Reuse Center. They sell reclaimed lumber and old doors. Maybe I can find something interesting and affordable there that I can use in lieu of plywood. We’re going to our very first Pennsic War in just 58 days … and I am beyond excited. I’ve wanted to go to Pennsic since the mid ’90s when I first discovered the SCA. My friend Tracy (Duchess AnneMarie de Garmeaulx) raved about it to me, and it’s been on my “bucket list” ever since. And this year I’m going with my son and Gregor. Tracy is lending me her pavilion (thank you, Tracy! ), but everything else I need to make or buy. It’s going to be a busy summer! Mock Trestle Table Project <– I really like this one! My thinking is that I can use this table as a sewing table when it’s not in use at camp, as I really need a nice, big table for all my sewing project.